Judy Barrasso is a founding member of Barrasso Usdin Kupperman Freeman & Sarver, L.L.C. Her practice focuses on commercial litigation, and includes complex commercial litigation matters and class actions involving insurance coverage and bad faith, director and officer liability, securities fraud, and commercial contracts. Judy is a member of the American College of Trial Lawyers and a fellow and Past President of the International Society of Barristers, organizations that select their members. She is a Past President of the New Orleans Bar Association. Judy was inducted into Tulane Law School’s Hall of Fame in 2018. She was the 2017 recipient of the John R. “Jack” Martzell Professionalism Award, presented by the New Orleans Chapter of the Federal Bar Association. She was also the 2016 recipient of the Louisiana Bar Foundation's Distinguished Attorney Award. 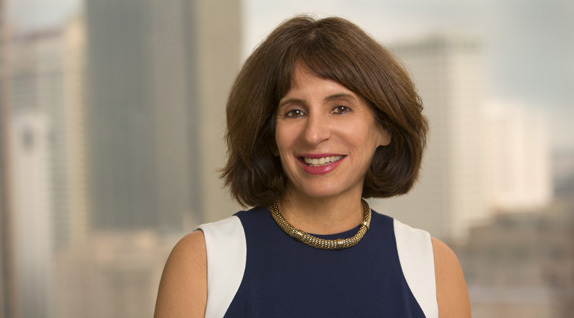 Judy has taught as an adjunct professor at Tulane Law School, the Louisiana Association of Defense Counsel Trial Academy, and at continuing legal education programs throughout the United States. She previously served as a board member and then chair of the Louisiana Attorney Disciplinary Board from 2001-2005. She also served on the Attorney Disciplinary Committee of the United States District Court for the Eastern District by the Court’s appointment from February 2011 – July 2017. National Coordinating Counsel for Insurer in Sandy Storm litigation. Court appointed Insurer Liaison Counsel in Hurricane Katrina litigation. Court appointed Insurer Liaison in Chinese Drywall MDL. Court appointed Insurer Liaison Counsel in putative legionella class action. Led the defense of multiple insurers in thousands of class actions and coverage disputes arising out of Hurricane Katrina. Led team defending insurer in statewide Preferred Provider Organization litigation, including successful arguments at U.S. 5th Circuit and Louisiana Supreme Court. Led trial team successfully defending commercial general liability insurer in coverage trial in federal court in Houston. Successful defense of director and officer liability insurer against environmental claims in a class action arising out of a chemical spill. Led trial team defending commercial general liability insurers in environmental coverage case in New Mexico arising out of multiple uranium mine sites in New Mexico and Arizona. Defending insurers in Attorney General litigation in Mississippi federal court. Defending homeowner insurer in Crumbling Concrete Foundation putative class action in Connecticut federal court. Defending homeowner insurer in labor/depreciation putative class action in Arkansas federal court. Defending excess commercial liability insurer in a MDL securities litigation class action suit. Defending excess insurer in directors and officers liability litigation in Texas federal court. Defending excess insurer against a bad faith claim coverage dispute in multidistrict litigation related to a large oil spill. Defending excess insurer in multi state coverage litigation arising out of sinkhole damage. Member of trial team successfully defending retailer in collective action under Fair Labor Standards Act. Successfully represented international oil and gas company in an arbitration involving multi-million dollar contract dispute. Co-counsel for large independent oil and natural gas exploration and production company in suit relating to arbitration involving multi-million dollar drilling contract dispute. Judy is a Commissioner of the New Orleans Downtown Development District, and a Past Chair. She is a Board Member of the Contemporary Arts Center. She previously served on the Board of Directors of Newman School, the New Orleans Pro Bono Project, Summerbridge, Dress For Success, and the Anti-Defamation League (South Central Region). Judy was named a Young Leadership Council Role Model in 2004, a YWCA Role Model in 2000, and a CityBusiness ‘Women of the Year’ honoree in 2001 and 2014. Five Partners Recognized by New Orleans Magazine as "Top Lawyers"
Four Partners Recognized by New Orleans Magazine as "Top Lawyers"